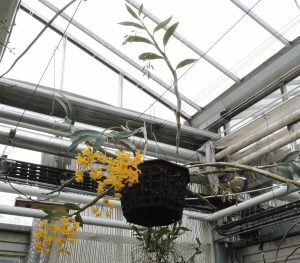 We have never had so many Dendrobium species on a London display and one that is bound to attract a lot of interest is this species. 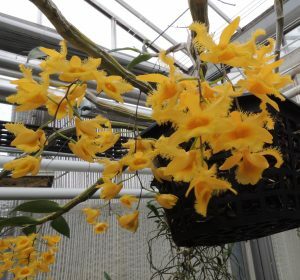 This wonderful dendrobium is native to Southern China and South East Asia where it grows as an epiphyte at around 1100-1700m in seasonally dry forest. It is semi deciduous and flowers from new and old pseudobulbs together in a fantastic display of its intricate flowers with long filamented edges to the lip and petals. 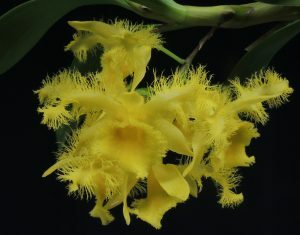 The flowers are produced in sprays similar to the closely related Dendrobium fimbriatum. Books recommend a cool winter rest for the species and we keep the plant into Warm Asia (min 18C) when in growth and move it to Cool Asia for a rest when the growths are fully mature in late autumn. The cool rest then initiates an abundant flowering in late spring, although this year it is a month earlier than usual. When we have kept the plant in Warm Asia throughout the year the flowering has been rather sparse in comparison. We find the plant enjoys growing in a basket and with its extensive rooting we drop the basket into a bigger one when needed rather than causing lots of disturbance to the roots. The flowers are sweetly fragrant and last about a week.